Until I'm able to afford a cocktail dress from Alber Elbaz's line for Lanvin, or even make it to the launch of one of their signature lines such as the collection for H&M last year, I'll have to make do with a Lanvin fragrance. Which, it turns out, is no great hardship. La Plume is the latest addition to the Lanvin fragrance collection and I was sent a sample to try. Although the box is a little generic, I absolutely adore the bottle which simply demands a vintage style dressing table to rest upon. Contained within a square frosted glass with a fabric label (LOVE this touch!) 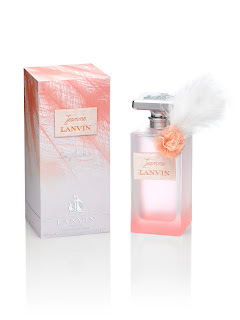 and topped with a mirrored Lanvin lid, the fragrance also features a delicate rose and feather decoration which sits in perfect contrast to the harshness of the sleek lines on the bottle. I'd have preferred this to be a permanent part of the design as opposed to a removable decoration although, having said this, I'm not sure how that would work without constantly getting in the way of the spritzer. ﻿So, what about the perfume itself? The initial blast is an overwhelming, sweet apricot fragrance which I really didn't like. I understand that they're trying to capture a femininity but it's verging on saccharine. I so wanted this to be an elegant yet modern scent and these initial notes really didn't give me that impression. If I didn't know otherwise, it could just as easily be another fruity floral celebrity offering (in fact, the notes remind me of The Body Shop Fuzzy Peach Perfume Oil which I loved so much when I was in my early teens). There's clearly a market for such fragrances so this isn't necessarily a critism- fragrance is, after all, one of the most personal beauty choices you can make- it's simply not for me & I'm disappointed as I wanted desperately to love this. The fragrance does retain much of these fruity overtones throughout the day although it mellows onto the skin and becomes much softer and for me, more wearable. I think that £49 for 100ml EDP does represent good value and I'd say it would be a good choice for an easy-to-wear summer scent.